For all your residential and commercial eaves, siding and roofing renovation needs, call Acme Reno's Inc. With over 25 years of experience we bring professionalism and quality to each client, to get the job done right! We are fully licensed and insured and welcome insurance work. 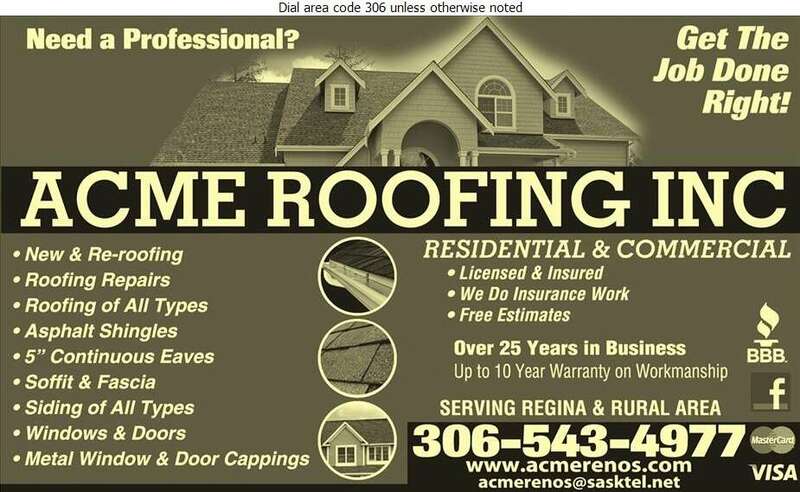 Whether you need a new roof, re-roofing, roofing repairs, soffit, fascia, siding, window installation, door installation or metal window and door cappings, we do it all! Our services extend to Regina and rural area. For more information call us at 306-543-4977. Free estimates are available. Acme Reno’s did an awesome job in re roofing our roof. They did an awesome job cleaning up and were timely in completing the job! I highly recommend their products and services.